Once there lived a Pauranika – a person who gives religious discourse. He was considered an expert with regard to discourse on the Bhagavata Purana. This also led to him having an inflated ego. Benaras or Kashi was then considered to be the highest seat of learning. Pauranika once approached the King of Benaras. and told him that while he had given discourses in several courts, he had one desire left, that of giving a discourse in the Benaras King’s court. The king was very pleased, but got down from this throne and, with folded hands, told him how it would be a great honour for him to listen to him but could the Pauranika please read the Bhagavad Purana once more before starting his discourse? The Pauranika was angry but as his anger would be of little avail in the presence of the king, he had no option but to go back and read the epic once again. As he did so, he found deeper meanings in the various passages. His anger evaporated as he realized that the king had good reason to make the suggestion he did. After completing his reading he once again approached the king with the same request, only to be told by the king to read the epic once more before starting his discourse. 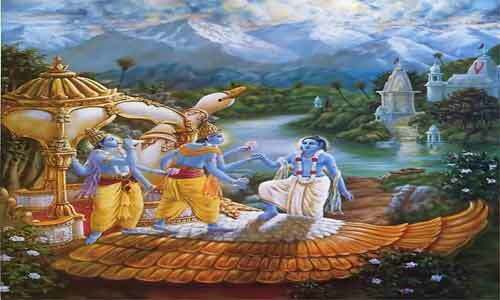 Dejected, he came back and plunged into reading the Bhagavata Purana once again. As he delved deep into it, he found that he was getting gradually transformed. His sense of ego left him and the desire to display his prowess before the king also disappeared. He read and re-read the book many times. Realising that the Pauranika was not going to return, the king rushed to his home, prostrated himself, and requested the Pauranika to begin the discourse as he had at last found a worthy teacher.